'Narconomics': How The Drug Cartels Operate Like Wal-Mart And McDonald's The cartels' business models are similar to those of big-box stores and franchises, says Tom Wainwright, former Mexico City bureau chief for The Economist. His new book is Narconomics. A Mexican soldier stands guard next to marijuana packages in Tijuana following the discovery of a tunnel under the U.S.-Mexico border in 2010. When Tom Wainwright became the Mexico correspondent for The Economist in 2010, he found himself covering the country's biggest businesses, including the tequila trade, the oil industry and the commerce of illegal drugs. "I found that one week I'd be writing about the car business, and the next week I'd be writing about the drugs business," Wainwright tells Fresh Air's Terry Gross. "I gradually came to see that the two actually were perhaps more similar than people normally recognize." 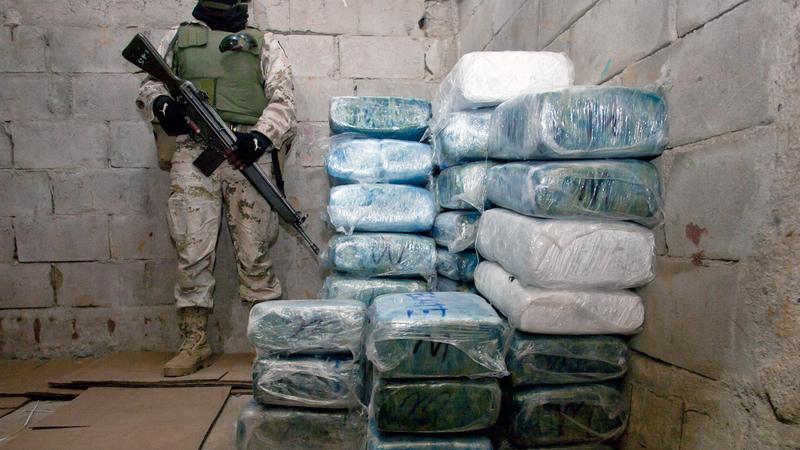 During the three years he spent in Mexico and Central and South America, Wainwright discovered that the cartels that control the region's drug trade use business models that are surprisingly similar to those of big-box stores and franchises. For instance, they have exclusive relationships with their "suppliers" (the farmers who grow the coca plants) that allow the cartels to keep the price of cocaine stable even when crop production is disrupted. "The theory is that the cartels in the area have what economists call a 'monopsony,' [which is] like a monopoly on buying in the area," Wainwright says. "This rang a bell with me because it's something that people very often say about Wal-Mart." 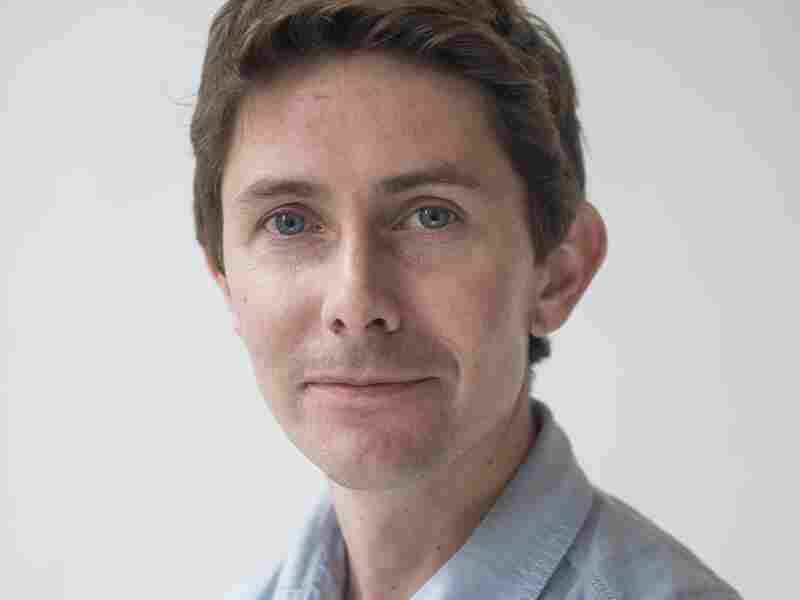 Tom Wainwright is now the Britain editor for The Economist. 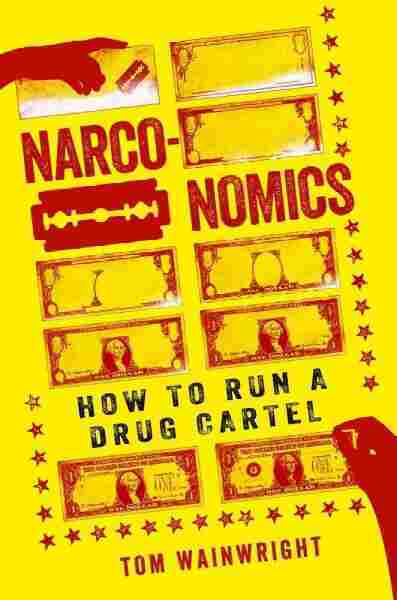 Wainwright describes his new book, Narconomics, as a business manual for drug lords — and also a blueprint for how to defeat them. When it comes to battling the cartels, Wainwright says governments might do better to focus on controlled legalization rather than complete eradication of the product. "The choice that I think we face isn't really a choice between a world without drugs and a world with drugs," he says. "I think the choice we face really is between a world where drugs are controlled by governments and prescribed by pharmacists and doctors, and a world where they're dealt by the mafia, and given that choice, I think the former sounds more appealing." I was looking at the supply chain of cocaine. I went down to Bolivia, and I went to visit some of the terraces down there in the Andes where the coca leaf is grown. The coca leaf is the raw ingredient for cocaine, and all of the world's cocaine is grown down there in the Andes in either Bolivia, Colombia or Peru. So I went down there, and I read about all the incredible work that's being done down there to try to disrupt the cocaine supply line, and you'll have seen footage probably of airplanes and helicopters dumping tons of weed-killer on these Andean terraces in Colombia, for instance. They've done lots of work on this and they've done a fairly effective job at making it harder to grow coca leaf. They destroyed hundreds of thousands of hectares over the years, and it has made the lives of cartels more difficult on the surface, at least. And yet, I looked at the price of cocaine in the United States, and it has hardly budged. You can go back decades, and the prices remain roughly $100 per pure gram. When you look at the economics of the supply chain, you begin to see why actually even if you could increase the price of that coca leaf, it's doubtful that it would have very much impact on the final price of cocaine in the U.S. or in Europe. ... To make, for instance, a kilo of cocaine, you need about a ton of coca leaf, and that ton, once it's all dried out, in a country like Colombia will fetch perhaps $400. Now, the kilo of the United States will fetch about $100,000. So let's say you're incredibly successful in managing to raise the price of coca leaf, and you manage to double it, to $800. If you then manage to transfer all of that extra cost onto the consumer, that final kilo of cocaine is only going to cost now $100,400. In other words, you can double the price of coca leaf and you increase the price of the final product, cocaine, by less than 1 percent. ... We're putting all this effort into raising the price of coca leaf, when in fact that's only a small part of the cost of the final product. The Zetas are one of Mexico's biggest drug cartels, and they've got a reputation for being one of the nastiest ones, so when you see pictures of people who've been beheaded or hung up from bridges, these are often the guys who are responsible. And while I was in Mexico, the Zetas expanded more quickly than any other cartel. It was extraordinary. Originally they came from the northeast of Mexico, but within a very short space of time, they spread across all of Mexico and in fact down into Central America as well. So I got to thinking about how they'd done this, and when you look at the way that they spread, it seems that what they do is that they go to local areas and they find out who the local criminals are, people who do the drug dealing and extortion and all the other kinds of crime, and they offer them a crime, they say, "OK, you can use our brand, you can call yourself the Zetas, just like us," and they give them, believe it or not, baseball caps with embroidered logos and they give them T-shirts with their logo on and they train them in how to use weapons sometimes, and in return the local criminals give the Zetas a share of all of the money that they get from their criminal activity. In other words: It's exactly like the kind of franchising model that many other well-known companies use. And it comes with all the same advantages and disadvantages [of franchising]. One of the big advantages is that it has allowed the Zetas to grow much more quickly. One of the disadvantages though, and this is something you often see in the legitimate franchising business, is that the franchisees often start to quarrel among each other, and the trouble is that the interest of these franchisees, the local criminals, aren't very well-aligned with the interests of the main company. Because as far as the main company is concerned — and this applies whether it's the Zetas or McDonald's — if you've got more branches, more franchises in a local area, that means more income for the main company, because they take their money as a slice of the income of the local franchisees. But the local franchisees have totally different motives. They want to be, if possible, the only ones in the area. They want as few branches as possible. And so you've had very often cases of franchisees suing the main brand over what they call "encroachment" — in other words, when the main brand has too many branches in the same area. This was a guy ... who I went to see in El Salvador, and he's called Carlos Mojica Lechuga, who is the leader of one of the two big street gangs in El Salvador. There are two of them — one [that he's the head of] called Barrio Dieciocho, or 18th Street Gang, as most people call it in English, and the other called the Mara Salvatrucha [MS-13] — and both of these are effectively transnational corporations, really. They make their livings dealing drugs and with extortion, principally, those are the two main business lines that they have. So I thought it would be interesting to go and speak to this guy and find out how he ran his company. So I went to see him, and he's in jail at the moment, which doesn't seem to be stopping him from running his business in any way. ... We sat down and we started talking business, and it really turned out that a lot of his complaints were just like the kind of complaints that I'd heard many times before from the business people. He complained about managing his staff, he complained about competition with his rivals, he complained about his image in the international media. It was really strangely reminiscent of speaking to a kind of frustrated midlevel manager. There's an interesting example underway in Switzerland where they've legalized heroin, which sounds crazy. But it's worth making clear that when they legalized it, they haven't put it on sale in the way that marijuana is on sale in Denver; they've just legalized it by allowing doctors to prescribe it to people who are already addicted, and it's had quite an interesting effect there, because many of the people who are addicted to heroin in Switzerland and indeed in other countries are people who deal the drug, because you're addicted to this drug, it's a very expensive habit, and for many people the only way they can afford it is to deal it on the side. So in Switzerland what they found is that by taking those very heavy-using addicts into treatment, they've stopped them from dealing the drug, because now they get their own drug free of charge from their doctors, and because they're no longer out there on the streets dealing the drug, the number of new users has dropped dramatically. So in Switzerland, funnily enough, since they "legalized" heroin in this very, very limited, restricted, controlled way, the number of new users has actually fallen quite a lot and, of course, the illegal supply has dried up almost entirely, because the supply is now run by the government.